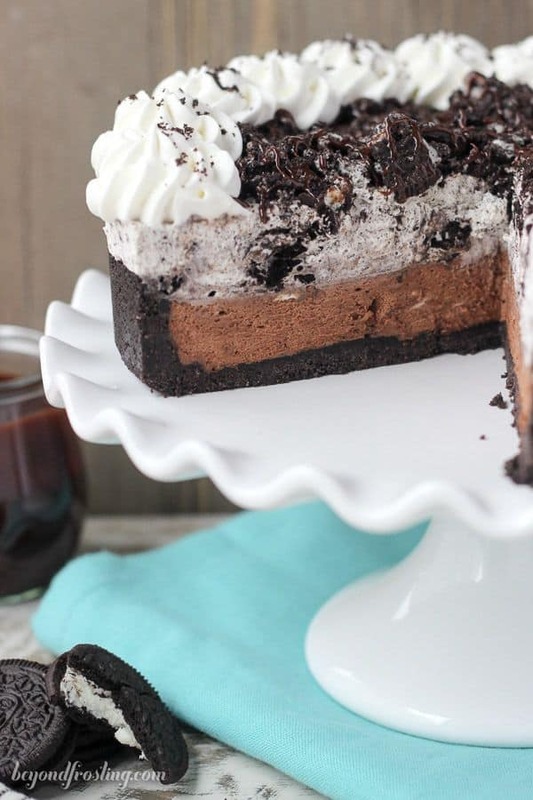 It’s all about the layers with this No-Bake Oreo Chocolate Mousse Pie. 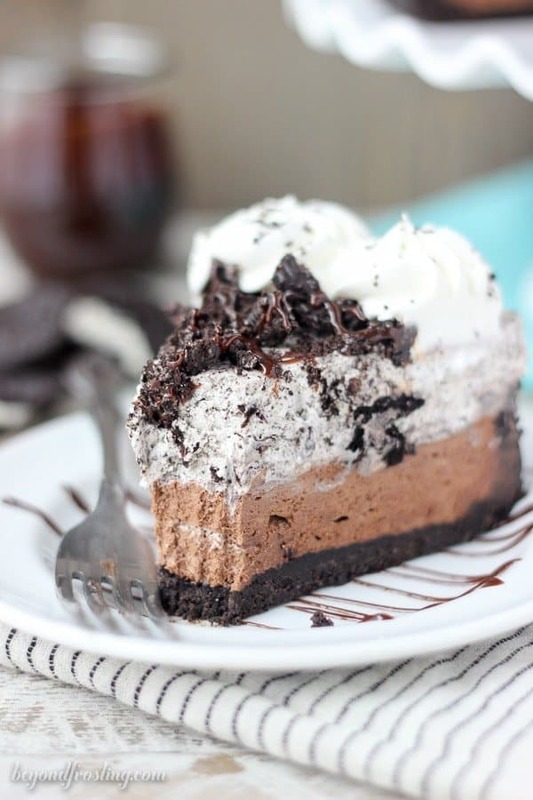 The thick Oreo crust is filled with a quick chocolate mousse, followed by a layer of easy Oreo mousse and topped off with more chocolate and whipped cream. Tomorrow is Pie (Pi) Day!! Math nerds everywhere love 3-14 but we dessert-loving humans use this day as an excuse to celebrate with actual pie. 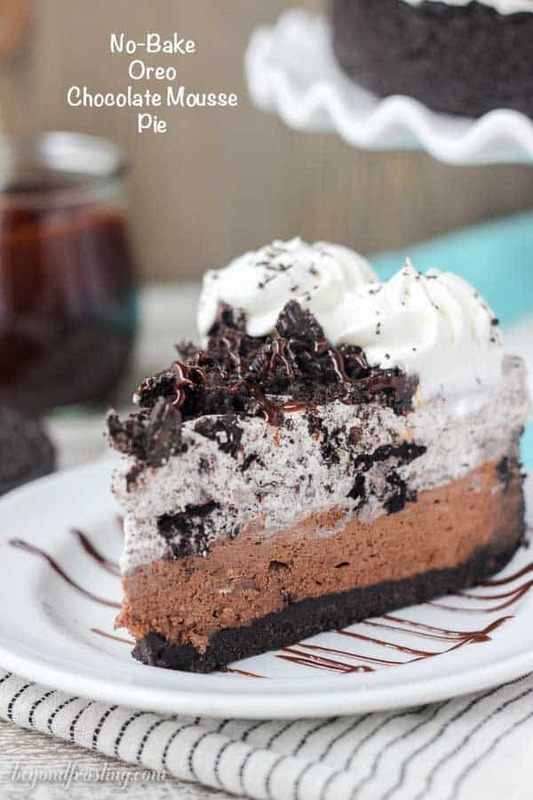 After my first bite of this Oreo Chocolate Mousse Pie, I knew I could crush the entire pie by myself. I didn’t even need a plate, I was just going straight in with a fork. This would be trouble, so I cut one slice for myself and one for my fiancé and put them in the fridge, and I gave away the other half of the pie. When I picked him up from the airport, we got home at 11pm and the first thing I did was grab the pie out of the fridge because I had been telling him how amazing it was the entire week. Together we crushed the first slice then and there. 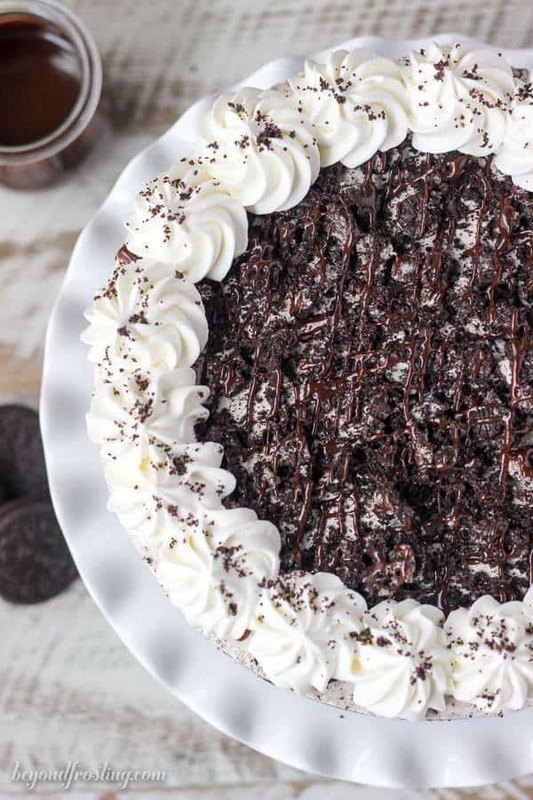 I asked him how he would describe this no-bake Oreo pie and he said, “Oreo-tastic”. I shouldn’t be surprised because anytime I’m making an Oreo dessert, he always wants in on the action as soon as my photoshoot is over. 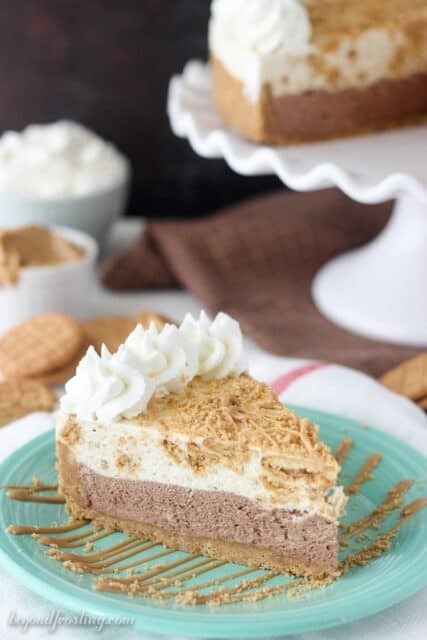 Several months ago I made a Nutter Butter Mousse Pie after being so completely obsessed with my No-Bake Brookie Icebox Cake. I felt like I needed a peanut butter version. I have no idea why it took me so long to come up with this Oreo version, but I can promise you there are more in the future. Don’t be intimidated with the long list of ingredients or instructions. Most of them are repetitive for the different layers. 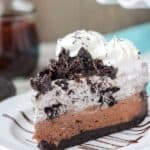 The bottom layer is an easy chocolate mousse made with melted dark chocolate, a touch of cream cheese and whipped cream. I always suggest using high quality chocolate for the best results. I prefer a dark chocolate baking bar such as Ghirardelli. You can find them in the baking aisle along side of the chocolate chips. I also added some gelatin to help with the texture. Just sprinkle the powdered gelatin over cold water and wait a couple of minutes for it to solidify. Then microwave it for a few second until it turns back to a liquid and stir it into the melted chocolate. 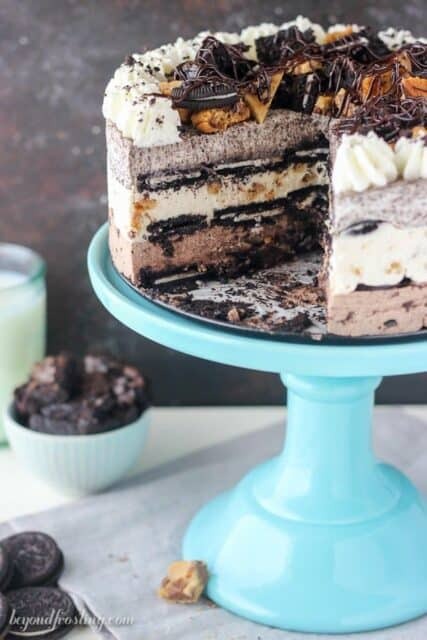 The top layer is an Oreo mousse, which is just stabilized whipped cream and crushed Oreos. The Oreos get nice and soft, almost cake-like in texture. Then I finished it off with more Oreos, hot fudge and some more whipped cream for garnish. You guys, I can’t even tell you how amazing this no-bake pie is. It’s the perfect balance of chocolate without being overwhelming and dense. It’ extremely light in texture, so you’re not left with a pit in your stomach after scarfing down a whole slice. Not that I would know anything about that. Grind one full package of Oreos cookies into a fine crumbs using a food processor or blender. In a small bowl, melt the butter in the microwave for 30 to 45 seconds. Pour the melted butter over the cookie crumbs and stir until the crumbs as well coated. For the chocolate layer: Place the mixing bowl and whisk attachment in the freezer for 5 to 10 minutes to chill while you are preparing the next steps. In a microwave-safe bowl, combine chocolate chips and 2 tablespoons of heavy whipping cream. Microwave in 30-second increments, stirring each time until the chocolate is melted. Next, melt the gelatin in the microwave for 5-8 seconds until it turns back to a liquid. Watch it closely! Stir the liquid gelatin into the melted chocolate and set it aside to cool. Prepare the whipping cream. Pour the heavy whipping cream into the chilled bowl and use an electric mixer to beat the heavy cream on medium-high speed until the cream gets bubbly. Slowly add the powdered sugar and continue beating on high speed until stiff peaks form. Set the whipped cream aside. 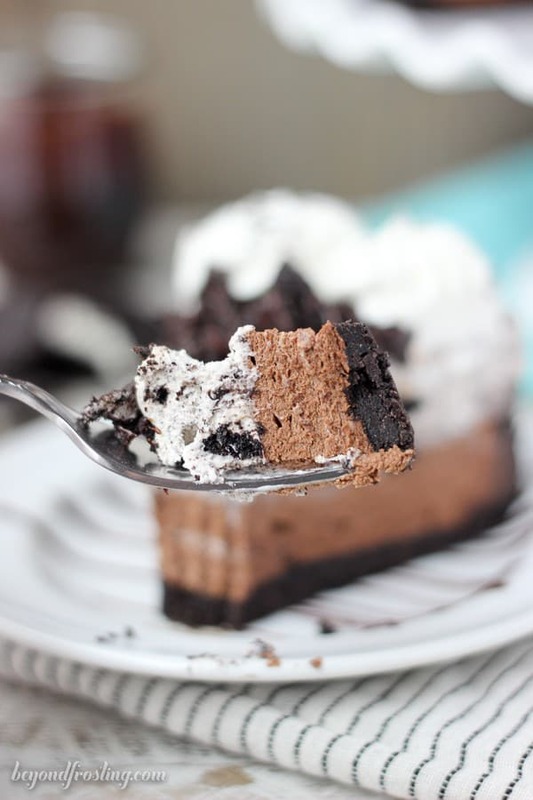 Scrape down the sides of the bowl, and add the melted chocolate, beating until it’s completely mixed into the cream cheese, scraping down the bowl as needed. Lastly, fold in the prepared whipped cream and mix until all ingredients are combined. Pour the filling into the prepared crust, spread evenly and refrigerate. For the Oreo mousse layer: Wash and dry your mixing bowl. Place the mixing bowl and whisk attachment in the freezer for 5 to 10 minutes to chill while you are preparing the next steps. Place 1 tablespoons of cold water in a small dish. Sprinkle the gelatin over the cold water, trying to spread the powder evenly. Allow the gelatin to turn to a solid (about 2-3 minutes). Next, melt the solid gelatin in the microwave for 3-5 seconds until it turns back to a liquid. Watch it closely! Prepare the whipping cream. Pour the heavy whipping cream into the chilled bowl and use an electric mixer to beat the heavy cream on medium-high speed until the cream gets bubbly. Slowly add the powdered sugar and continue beating on high speed until peaks start to form. Slowly pour the liquid gelatin into the mixing bowl and continue mixing until stiff peaks form. In a large Ziploc bag, roughly chop and smash 10 Oreo cookies into small pieces/crumbs. Fold the smashed cookies into the prepared whipped cream. Pour the whipped cream over the chocolate layer and spread evenly. Refrigerate the pie for 3 to 4 hours until all layers are firm. When ready, remove the sides of the pan and prepare the toppings before serving. For the topping: Place the mixing bowl and whisk attachment in the freezer for 5 to 10 minutes to chill while you are preparing the next steps. Prepare the whipping cream. Pour the heavy whipping cream into the chilled bowl and use an electric mixer to beat the heavy cream on medium-high speed until the cream gets bubbly. Slowly add the powdered sugar and continue beating on high speed until stiff peaks form. Pipe the boarders of the pie with whipped cream using a large open star tip. Heat the hot fudge according to the instructions on the jar. Drizzle over the top of the pie. 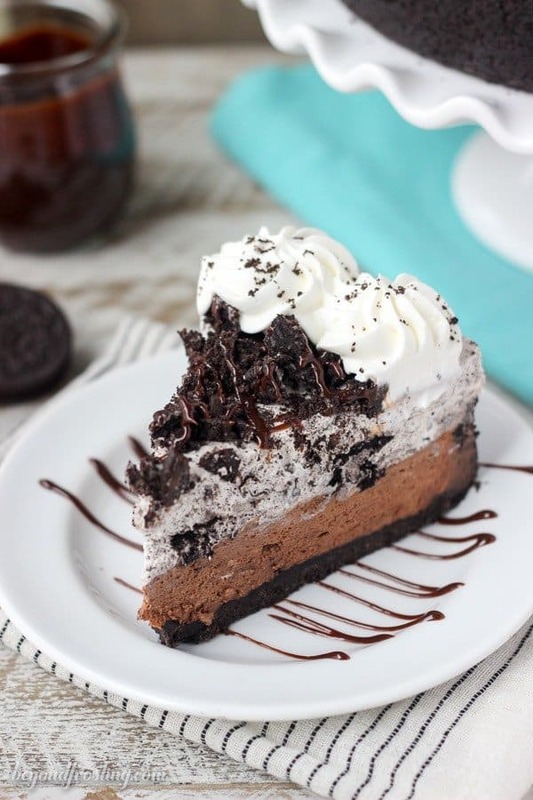 Smash the Oreos cookies and sprinkle them over the top of the pie. Slice and serve! This pie must stay refrigerated. Hey! This was delicious! I used one family sized pack of Oreos and instead of sprinkling Oreos on top I made a ganache. Thanks for the recipe. Awesome Lisa! I am so glad you enjoyed!! I love this recipe too! Hello, how can I adjust this to mini sized ones? Hi Tehreem, I’ve never worked with a mirror glaze before. This would be stable enough for you to pour a glaze over, but I would suggest to free for 30-60 minutes before hand for added stability. Instruction is kind of confusing and please clarify “edges”. You grease “edges” ad then wipe gently with paper towel? Hi Hazel, by grease the edges, I mean the sides of the springform pan. You want to lightly coat the sides of the pan, but the reason for wiping it with a paper towel is so that there is no areas of concentrated grease. Ingredients don’t match the directions?? 2 packages of Oreos for the crust, but only grinding 1 package in the directions. And, 12 Oreos for mousse layer needed, and directions say 10 cookies? Hi Teresa, sorry for the confusion. I list 2 packages because you need 1 full package for the crust and a second package to pull from for the filling. I’ve added the word “divided” for future clarification. I would hate for someone to get home and realize they don’t have enough Oreos! I’ve corrected the ingredients to list 10 Oreos, although 10, or 12 or even more would be fine if you want a chunkier filling. I hope you enjoy! This could very well become my new all time favorite! Real good! OMG=OreoMyGoodness ~ I need to make this and share. Cuz who doesn’t need more friends, right? Happy Pi Day.